Enjoy a relaxing night's sleep in your spacious Sweet Bed by ibis double bed with comfy pillows. Our soundproofed, air-conditioned Standard Rooms for 2 people also include a desk, TV and free WIFI. If you are traveling together but prefer to sleep in your own bed, our soundproofed Standard Room with twin beds is the perfect solution. The room also includes a desk, flat-screen TV and free WIFI. Traveling as a family? Our soundproofed Standard Rooms with 1 double bed and 1 single bed offer revolutionary Sweet Bed by ibis sleeping comfort. The rooms also include a desk, TV and free WIFI. Very good location, the staff was helpful and I got what I wanted. There were no problem. The rooms are not big, but it is enough for short trips. As it is in the city center I cannot say that it is quite. The hotel is well located very close to the Westbahnhof, the hotel is very clean and the majority of the staff are very friendly and helpful, the rooms are kept very clean by the excellent cleaning ladies. The breakfast is very good but one downside is that the breakfast rooms get very crowded at all times but fortunately the staff keep everything clean and the tables are quickly cleaned when someone moves on. If you like your WIFI it is better to ask for a lower room as the higher you stay the WIFI signal gets much weaker, I stayed on the 7th floor and most of the time I could not get a signal, in the lobby it is fine. The transport links around the hotel are very good.. The U3 metro will take you into the Centre in 10 minutes, the Strassenbahn 18 will take you to the Hauptbahnhof in about 20 minutes, the hotel is very close to the Westbahnhof you can walk there in a few minutes but the trams 6 & 18 from directly outside are perfect for those of us who prefer not to walk. The excellent Café Westend is 5 minutes walk from the hotel, in my opinion just as good if not better than its so called more illustrious counterparts in the Inner City and the Ring area. The mélange coffee, cakes and sweets are superb and the Wiener Schnitzel(kalb) is pretty good too. The main shopping street Mariahilferstrasse is just around the corner with all the well known shops. Especially at night it is advisable to stay well away from the side streets around the Westbahnhof especially if you are alone. Yes, I would recommend this hotel to anyone travelling to Vienna, the rooms are a good size, bathrooms are adequate in size. Just be careful in the area at night and you will have a great time in the Ibis Mariahilf and Vienna. Good hotel, good breakfast, quiet rooms. There is a direct bus from the airport that takes you to the station which is 3-4 minutes walk from the hotel. The hop on hop off tour stop (Big Bus - blue line that takes you to Schönbrunn) is right in front of the hotel. You can walk to major attractions (Mariahilferstasse is 5 minutes walk away, The History of Natural History, of Art and other museums are at 20 minutes walking distance). Standard room with comfortable beds, clean bathroom, but what we liked the most was very good breakfast(6:30-10:30) . We were there on new year so it saved us when the shops were closed. Location excellent ( close to bus/train/metro station). Hotel was very clean, great staff with hospitality.. location is a good only problem for us was that it was too cold and we had to walk each time almost 7 min to reach the metro station ... breakfast was more then perfect with great varraiety, room was very clean but too small and toilet too was too small, no mini bar or hot beverages in room but it was ok we didn’t need it... there were a very bad point I don’t know it was by luck or it always happens !! They have 3 elevators, one was broken for all the 7 days and the 2 others were too slow always crowded we had to wait each time for almost 10 min to use it and worst they were broken for a day and we had to use the exit stairs from the 12th stage ... but in overall it was ok and we enjoyed our stay ..
We were very happy to stay in this hotel. It was very good service, nice breakfast and good location. The room was clean and had nice view. The staff were friendly and helpfull. We were very happy to have nice time in Vienn, Austria. It was wonderful! As on my several previous visits to the Ibis, Mariahilfe I was comfortable, staff helpful and efficient and I enjoyed being there again. I look forward to the next visit. it is clean hotel with polite stuff. it's on a good location. room is big enough bathroom is ok. the only thing it should be better is bed. the size for single should be bigger and also the top matress should not move. Hotel is located just 2 minutes from a tram station and just 8 minutes from the Metro/main line train station. Staff very friendly and the rooms standard and clean ibis style. Internet easy and sufficient. Have stayed in Ibis before so knew what to expect. This hotel is in a good location for the underground with the Wien Westbahnhof station within a 5 min walk. Shopping streets and Mall nearby including the Vapiano restaurant which is great if you like pasta/pizza. The room itself was clean although being situated at the front we got some traffic noise at night from the busy roads. The rooms don't have a safety deposit box or kettle. Shower was excellent. Breakfast was varied and of good quality. Staff were efficient and helpful. For some years now, whenever I travel to Vienna I try to book at ibis Wien Mariahilf. Also this time it was a very good experience: good room with a nice view, comfortable bed, good bathroom / shower. Check-in / check-out were quick and easy, staff were helpful and friendly, breakfast was good with a lot of choices. For some years now, when I travel to Vienna I stay at ibis Mariahilf. It's a very good hotel, close to public transportation. Also this time, my room was good, the bed was comfortable, the bathroom / shower were in perfect order. Breakfast was very good, with plenty of choices. Check-in / check-out were quick and staff were friendly & helpful. Hotel good. Good breakfast. Good location for transit through Vienna (easy access to entry and exit for the West of Europe.) Friendly and kindly staff. good location for walking on the city.Parking inside. 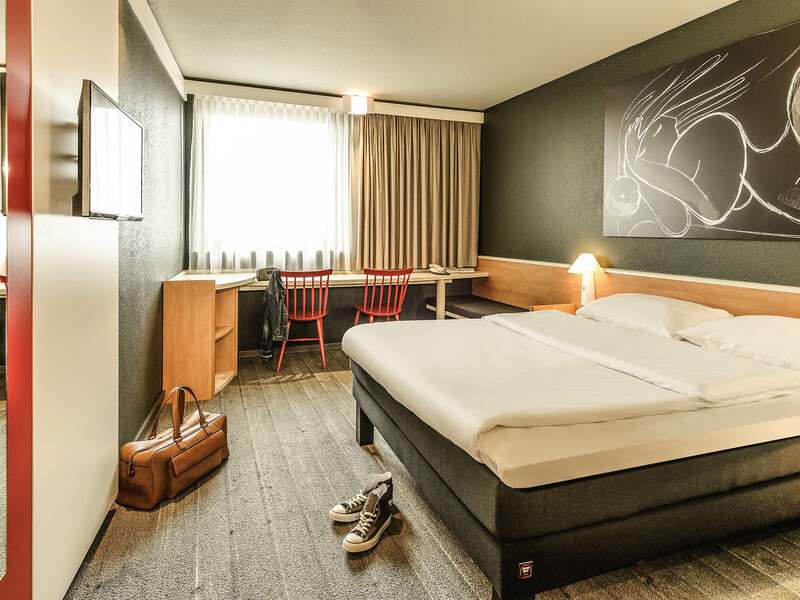 Situated in the vicinity of the Westbahnhof the ibis Wien Mariahilf offers easy access to the city centre via the Metro (10 min) and to the Palace of Schoenbrunn by bus (10 min). The staff are friendly and helpful and the hotel experience (including breakfast) was very good. Good selection of eateries close by. The hotel is very nice. Basic (as all Ibis) but clean and good located. Very good wifi. I didn’t try breakfast because the receptionist told me that for my 11 years boy I had to pay the same money as per adult. It was my 3rd time here and I knew that for children under 12 the fee is half. One week later, when we stayed at this hotel, the receptionist (not the same) confirmed the half price. Not a big deal, but it would be nice to know exact price for services. Welcoming, friendly reception. Room was clean and comfortable. The hotel is very good for those who wants to visit the city. Close to the centre and the shops, not very far from the others turistic places. Nice people, good breakfast, comfortables rooms. A good choice! Nice welcoming atmosphere, good view from 6 floor, good breakfast; We enjoyed our experience and would like to come back again. Location is very convenient. Parking in the garage is at a reasonable price.